This blog post by Tom Malinowski originally appeared on the State Department’s Dipnote blog. Malinowski is the assistant secretary of state for democracy, human rights and labor. One unfortunate effect — and perhaps intent — of the Russian government’s threats against eastern Ukraine has been to divert the world’s attention from the part of Ukraine it has already seized. On April 15, the U.N. High Commissioner for Human Rights issued a report on Crimea documenting what the Russian government has tried to hide by denying international monitors access to Crimea: the imprisonment, torture and killings of Crimean citizens who opposed Russia’s illegal annexation of the peninsula prior to the March referendum. The world is already familiar with some of the more horrific reports that have emerged in recent weeks, such as the discovery on March 18 of the body of Crimean Tatar activist Reshat Ametov two weeks after he had been abducted, bearing clear evidence of abuse. On March 25, Human Rights Watch reported that two Euromaidan activists in Crimea had been kidnapped and brutally tortured by Russian and local forces in secret facilities for 11 days. After spinning a fictitious tale of protecting members of the ethnic Russian minority in Ukraine, the Russian government and its proxies are subjecting members of ethnic minorities in Crimea to the very abuses they pretend to oppose. On March 31, pro-Russian thugs beat a 14-year-old Tatar boy for speaking Tatar in public. On March 18, Crimean Deputy Prime Minister Temirgaliyev announced that Tatars must give up their land to be used for other purposes. On March 15 and 16, pro-Russia thugs kidnapped Ukrainian Greek Catholic priests, interrogated them, and had local “authorities” charge some of them with “extremism.” Following anonymous death threats, the Chief Reform Rabbi of Crimea has fled. All told, international organizations report that around 5,000 people, including minority Christians, Jews and at least 3,000 Tatars, have fled Crimea and sought refuge elsewhere in Ukraine. • A Loss of Autonomy. Even as President Putin demands decentralization in Ukraine, he is abolishing it in Russia. A new bill in the Duma could cancel direct mayoral elections in Russia, stripping citizens of their ability to elect their local leaders. • Censorship and Propaganda. As has already been done within Russia, Russian authorities have tried to limit Crimean residents’ access to TV channels that are not Kremlin-controlled. From Russia’s Internet space, Crimean residents could find themselves unable to access certain independent news sites. • Criminalization of Dissent. The Russian government could attempt to subject Crimean residents who wish to express dissent to its arsenal of laws unduly restricting freedom of expression, including Russian-style prosecutions of journalists and activists for “extremism” and “hooliganism” simply for expressing independent views. 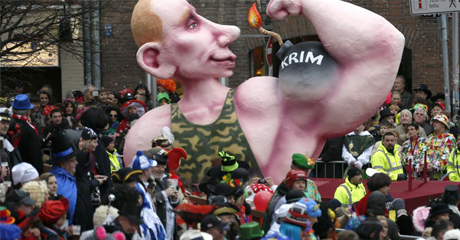 Russia will continue to pay a high price if it continues to occupy Crimea. Sanctions imposed because of its actions in Crimea will remain so long as those actions continue. And we will increase these costs if Russia does not follow through on the commitments it made in Geneva on April 17 to de-escalate the crisis it has manufactured in eastern Ukraine. We will also continue to empower Ukraine to withstand Russian pressure and move towards a prosperous and democratic future. In recent days, the United States has signed a loan-guarantee agreement with Ukraine to unlock $1 billion in financing, which will help the Ukrainian government to provide critical services and protect vulnerable citizens as the government implements necessary economic reforms. We are providing additional assistance to support those reforms, as well as free and fair elections, anti-corruption initiatives, recovery of stolen assets, and helping Ukraine withstand politically motivated trade actions by Russia. The desire to live in freedom, under a state that serves its citizens, not the other way around, is universal. Ukrainians don’t want to lose their freedom. Their fellow citizens in Crimea, and neighbors in Russia, deserve to reclaim it.